preciosa wrote: Just curious about peoples opinion on getting a flu shot please...it seems less and less are getting it every year. I had a flu shot last year for the very first time in my life and a couple weeks after I got it I had an on going dry cough for three months and I guess I blame it on that injection??? I've never had a cough since and don't ever want it again...so just nervous to get the shot this year. the flu shot did not cause your cough it is a separate virus. sigh. some people. and why would you put question marks on, I guess I blame it on that injection??? are you asking us what we think you think? I've never had a flu shot, and can't remember the last time I got the flu (it was over 20 years ago, at least). Some folks who get the shot seem to get side effects, others don't. And some folks who get the shot get the flu anyway, whereas others (like me) don't get the shot and still don't get the flu. So I'd say that there is little evidence (other than anecdotal) either way. I know some doctors who never get the shot, so it's not just me who thinks that there's insufficient proof of its benefits. However anyone associated with the Public Health Department will tell you it's in your best interest to get it. So, at the end of the day, the final decision really is up to you. I haven't had a cold or flu in many years, I contribute it to eating items vitamins & washing my hands before touching my face. Unless one has an inherently weak immune system, or is very old or young, I see little reason to get one. Last time I got the flu (long ago), I simply ate more fresh fruit and vegetables and it went away quickly. Since I was young, developing a strong immune system without drugs was a priority. Edit: I forgot a word. Normally I wouldn't be bothered, but I have to get the flu shot for work. With saying that, I am just getting over the flu. I haven't had the flu in forever, and it was horrible. I am also a healthy, able bodied young person and could barely function. I can see the importance of getting one depending on the situation. ETA: I have not had my flu shot this year. and get your free flu shot in January????????????????? No one on earth knows the answer to that huge question. how the shot affects old people long term, but for kids - they have their whole life ahead of them. trust the flu shot manufacturer. They know what's happening with flu varieties this year. People who experience a change, or take a medication, or eat or drink something different then attribute something that happens, to the change and not that fact that something just happened. I knew an electrician, and frequently when he was in an office fixing a light, or whatever, invariably an electric office machine would suddenly quit and they would approach him, asking what he did to their "typewriter" (it's an old story). One town, implemented fluoridation of the water. It was scheduled for midnight on a certain date. Several complaints came in the very morning of the start of fluoridation. This or that happened. It happened exactly coordinated with the date of implementation. The town then advised the complainers, that they actually started the fluoridation of the water a week earlier than announced. I, personally have elderly parents. I trust that the shots give some protection, some years better than others. If it might help me not spread the flue to one of them, it's worth my time to get the shot. The medical community says it helps. I take that assertion with more credibility than some talk show or Castanet poster. them what is in the flu shot, they can't answer. They don't know anything, I've found. Flu vaccines in multi-dose vials contain thimerosal to safeguard against contamination of the vial. I posted a link to information. 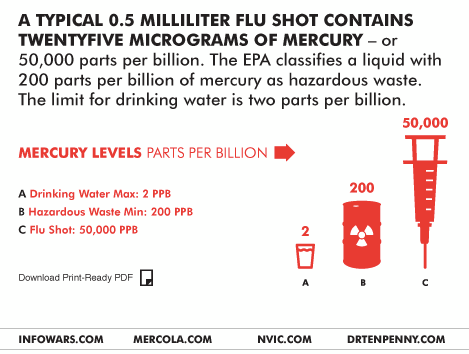 Thimerosal is not in all flu shots. Where did the graph come from Thinktank - more misinformation? It wasn't shown on the link you provided nor does the graph explain the differences between the mercury compounds. ...and a person administering a medicine or a vaccine would need to know this because ? You are an ill-informed fear monger. Shame on you. The graph doesn't come from the CDC site but appears it's from a blog - hardly reliable info. Have to wonder if employers who force thier workers to get flu shots, are potentially setting themselves up for a class action suite if they're ever discovered to be harmful. Who forces? Masks are available. Poindexter wrote: Have to wonder if employers who force thier workers to get flu shots, are potentially setting themselves up for a class action suite if they're ever discovered to be harmful. Ah, yes, it's flu shot time once again, and all the "sky is falling types" are massing around their little keyboards.